Whether you're a designer, a developer or an entrepreneur "App Success Stories" shares the secrets of success from coming up with the great idea to executing it. 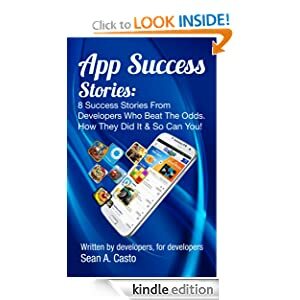 "App Success Stories" takes you through the broad and diverse range of success stories from indie developers to small and midsize app development firms in iOS, Android and Windows. This nontechnical, easy-to-follow guide walks you through 8 real world examples to inspire those looking to hit it big. The e-book provide insight on improving your chances to release a best selling app. "App Success Stories" is an easy to read guide on app promotion and success that every developer should read to make the most of your app.